Like most of you, I read a lot of food blogs. It’s getting to the point now where you can find out just about anything you need to know about any kind of food just by searching food blogs alone. But I’ve also come to realize that there are a lot of great blogs out there that have nothing to do with food. In fact, I am sometimes overwhelmed by the sheer amount of good, entertaining writing floating around, free for the taking, on the web (I will get to the bumble bee part soon!). So how do I figure out what to read? It’s simple. I tend to return to blogs where I have developed some kind of relationship with the writer. It’s when I start to feel that I know someone on a personal level that I become interested in what they have to say, day to day, week to week. So whether the dialogue starts through blog comments, e-mail, IM, telephone, or even in person (as has been the case lately), it’s the dialogue that keeps me coming back. So, as I was saying, I am a loyal reader of a few non-food blogs (yes, I divide the millions of blogs out into only two categories: food blogs and the others) and the other day I read something on a friend’s blog that stopped me in my tracks. The post, from Emon at Emonome is called “Finding Other Bumblebees” and it broaches the well-traveled subject of learning to be yourself. It’s been said a million times in a million different ways. Learn to be yourself. Don’t worry about what the others think. Do your own thing. You have to learn to love yourself before you can find true love. But Emon’s post hit me like a ton of bricks. You see, his post was inspired by Blind Melon’s “No Rain” video. You remember that video, right? The one with the awkward little girl in the bumble bee costume. If, at this point, you have no idea what I’m talking about, go to Emon’s post and watch the video before reading any further. Back now? Good. Now that we’re all on the same page, I’ll tell you why that post and that video have been running through my head for the past three days. Everyone loved that video when it came out all those years ago. But one person in particular really loved that video. And that person was my mom. My mom loved that video. My mom was that video. My mom was the only person I know who could wear that bumble bee costume when everyone else in the world was wearing something different. This was her costume: 501 jeans and Birkenstocks (before they were cool); long straight hair and no make-up; neon-colored sunglasses (free from Carl’s Jr.) and Fresno Grizzlies t-shirts; a purse large enough to smuggle super big gulps into movie theaters; clog-dancing in the supermarket; Pearl Jam concerts; howling at the full moon; baseball games and sign language classes; blues festivals and art films. That was my mom. That was K. She did what she wanted, she wore what she wanted, and people loved her. My mom was killed by a drunk driver almost 10 years ago. My sister and I were both in college, searching for own inner bumble bees. And I never had a chance to ask her how she found the courage to be herself. It does take courage to be yourself, more courage than any self-help book will ever tell you. I’ve struggled my whole life trying to figure out who I am and what I want to be. And right in the middle of figuring it all out, my world came crashing down around me. I survived, as we all do after the death of a loved one. But when I re-emerged , I was missing some parts. We all were. I had to start my search over, from scratch. Except this time around, without my mom as a role model, I was asking the wrong questions: Who should I be? What do others want me to be? I didn’t realize that this change had taken place. It no longer even occurred to me that I already was the person I wanted to be or that I was already doing the things I should have be doing. But that’s changing now. Those of you have visited Pinch My Salt in the last couple of weeks know that I am now in central California visiting my family. Coming home to California is always difficult. My mom’s house was my home. Every night I have stayed at my dad’s house, my grandmother’s house, my aunt’s house, my cousin’s house, or my friend’s house has just been a reminder that I can no longer go home. As much as I love my family, as much as they try to make my sister and I feel at home, it will never be the same. I have been searching for a home for the past 9 years. Searching for that place where I can feel completely comfortable, where I can be myself, where I don’t have to worry about anyone or anything. Where I can just be. What I didn’t realize is that I need to find that place within myself. It isn’t my mom’s house that I’ve been missing. It’s the feeling I had when I was around her. The feeling that I can do whatever I want and be whoever I want and who cares what the rest of the world thinks. I was taught to believe these things by both of my parents. But I lost sight of it. Emon’s bumble bee post happened to come at the right time. If I had been in Sicily when I read it, the impact wouldn’t have been the same. I am in the right place to find my inner bumble bee. I am home. Now, about that photo! I wasn’t the only one who was affected by the bumble bee post. JD over at FourBux was inspired not only to find his inner bumble bee but to draw it. And this in turn encouraged others to follow suit. So we now have a little community of bumble bees that seems to be growing bigger. My bumble bee photo was something silly I did to contribute to this growing bumble bee community, but the photo was also inspired in part by Genie from The Inadvertent Gardener, whose Taking a Dare post helped me get over the fear of putting a huge photo of my face on the front page of my blog! 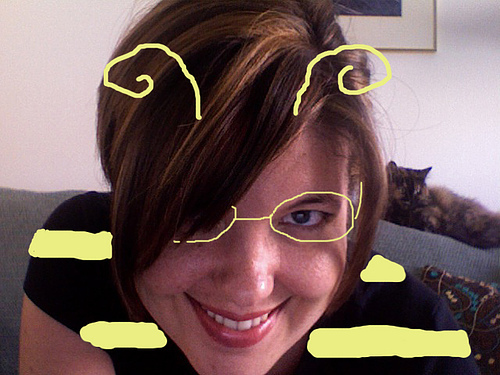 But most importantly, this silly bumble bee photo is a symbol of me coming to terms with some pretty important things. I am the person I want to be. I am doing the things I want to do and therefore these are the things I should be doing. And as scary as it is, I am going to accept myself for who I am and just go for it! Nicole, I am so proud of you (even if I mostly only know you from your blog) -- you're beautiful and talented and absolutely courageous. It's never too late to embrace that self-acceptance and spit in the eye of fear. Rock on, chica. I applaud you from flyover country. wonderful post, and even though i just "met" you i think this is great and i av=m very glad for you... i rarely go back to where i grew up, some 3,000 miles away, because this is my home... i live in california now, grew up in a small coal town south of pittsburgh, pa., and my children are here my new family is here, and this is my home. let me be the first to welcome you home again... ;) ...and yes, i teared up a little. Oh Nicole...I love you're post! I don't think there is a person out there that can not relate to this in one way or another. At the end of the day it's what it all comes down to!! You're very courageous for sharing with all of us...And I LOVE the picture:)!! I don't even know what to say. I love you. You made me cry! I am proud of you and I can't wait to see what you do in the future! Hey thanks for the post! Your the first person outside family and friends to look at it! I love your blog I think its great! Genie: Thanks, and the same goes to you! Erik: Thanks for the welcome home :-) Dani: Thank you. It was difficult to write this but sometimes it's even harder to keep things inside :-) Corinne: Sorry, I knew that would happen! But I did give a warning :-) JoeDrinker: Thanks. You're right, it's nice to connect to people regardless whether they live next door or across an ocean. Cara: Thanks for stopping by! My. I sat in front of the computer not knowing how to respond...for a long time. Reading this post made me realize that my own little post was only supposed to open doors to yours. Thank you for giving my post such respect and adulation. It makes me proud to be a part of this post. You perhaps are unaware how many people you inspire to be themselves and trust themselves. Be it with your writing, be it with your photography, be it the way you make others feel comfortable when they seek your help. You've helped me a lot with your suggestions, recommendations, and your support. I am grateful for that and will remain so. And most of all, I'm proud to have you as a friend. Lovely post. Your mom sounds like she was a great person. It takes people a long time to bee themselves, y'know; a lot of people in their 20s are, just like you were, trying to be what others want them to be, rather than themselves. Good on ya for discovering that you're who you want to be now, rather than waiting for your 30s or 40s (or even later) to realize that what others think of you shouldn't rule your life--it's what you think of yourself. Bravo per il suo coraggio! I've been reading your blog for a while now & you never cease to amaze me with your writing & photography. My beautiful mother passed away seven years ago & I still miss her terribly. She was definetly a bumble bee in her own right. I'm glad to see that you've found your inner bee. You have a gift for inspiring those around you... your work(s) never cease to amaze me!! Bravo for finding the courage to be yourself in this crazy world of ours!! See ya around lil'bumblebee!! Wow..what a blog. And I know it took some major courage to go there. Made me cry and still cry while writing. Can see the changes in you and cant wait to see more. And my new co-worker plays that Blind melon song alot--guess where it takes me back to? Times at your mom's house on days after junior college. Nicole you are one of the most strongest and independent women I know--which is also a descriptoin of your mom and why she left such an impression on all of us--your surrounding girlfriends as well. And I also have to say--that was a very therapeutic blog:) Very proud of you and see your future getting brighter. This was moving indeed Nicole and I am sincerely happy for you that you have found your home and that you're happy and at peace with yourself. You don't know how wealthy you are just by having that. Hugs. I think I have a way to go to find my inner bumblebee... but you've made me think I should look a little harder. Lovely post. Some of the best cookbooks I've read have stories that go with the recipes. Maya Angelou, for example. Wow that is some great food, and some great stories. My passion is public education, but I can't help but let some of my other life issues cross over into my blog. A beautiful lesson, beautifully told. Thank you for sharing and congratulations on your new-found you-ness. Now I have to buzz off and find a recipe for dinner. I do recognize that feeling of homelessness that happens when parents pass away. I'm learning to find that inside myself and within my love for mine but it's not easy, vero? Your mother sounds like a great role model but I'm sure she thought/thinks you are a great person in your own right! Wow. I don't think I'll look at a bumblebee for a while without thinking of your post. Thank you for putting yourself out there. Wow, that is awesome, Nicolea! You are brave! Hi there- I cried. I only know you through your blog (which I adore) but your words came to me at just the right time as well....sometimes we need a little reminder that we are: we are good, we are enough, we are smart, we are pretty, we are here. Thanks for offering such a beautiful reminder. thank you for the really important reminder. there are so many bees around town right now. they will help me remember that it's okay to be me and to just keep listening to my heart. your mom would be really proud of you. This blog brought tears to my eyes. I think that is so beautiful and your mom must be very proud of you. Thanks for adding a little joy to my heart today. Bee Blessed! My Mom died in August of 1979. I was 23. It really kicked me hard. On the surface I was fully functioning but inside I was a wreck and it took me quite a while to get my feet under me. Your Mom sounds wonderful and so do you. Thank you for sharing you! I came looking for Leek Soup (it will be cold and rainy tonight in California); I've never made it but yours looks like a great recipe. Thank you for the video. I had never seen it and I can't wait to share it with my college-aged sons. Again, thank you Nicole for you! Your mom sounds so much like how i would love to bee.(sorry,hehe). I always have had great admiration for people like your mom. I don't know how old you are but i am 44 years old and still am looking for the same thing you are. Being free of what other people think, want, and expect of me. I hope you find your bee hive someday that will make you feel free and happy and comfortable.......Dianne. p.s i am going to make this soup today and i will be thinking of your mom and how cool she is. I found this via your potato leek soup recipe, and I loved it so much. I love your openness, your honesty. You have inspired me, a 23 year old woman searching for the integrity to be who I am. Thank you!